A couple of days later we got moving relatively early for the Saturday markets in Tatong. It’s such a wonderful name, Tatong, especially when you allow the last syllable to linger on the tongue. “Tatonnnng, Tatonnnng” sounds a bit like calling in the cat for dinner. It’s south west of Glenrowan and the easy way was to cruise west to Benalla, which is the site of a dam that has been deliberately destroyed and head south, all up only 50 ks. 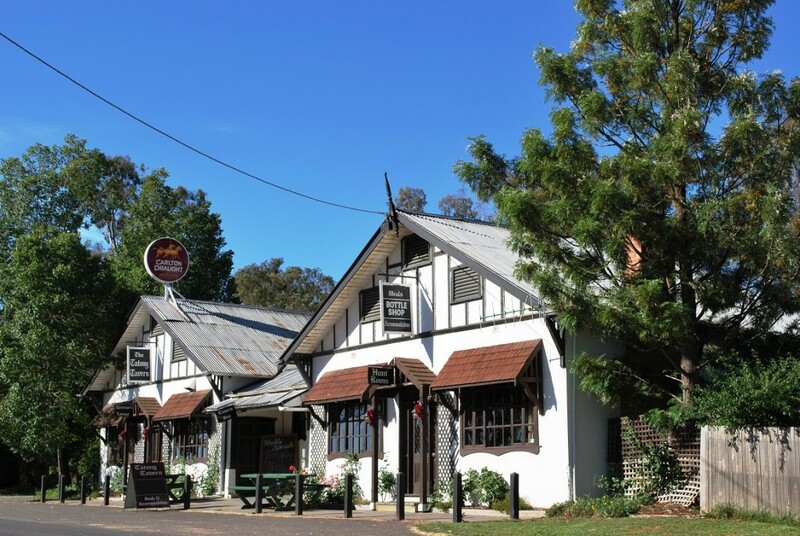 It’s one of those ‘blink’ places, but the pub, the Tatong Tavern, which IS essentially Tatong, looks a little out of place, maybe uprooted from the Swiss Alps or something. Next door, there is a small park and here is where we found the market. OK it wasn’t special, but the people were real ‘country’ and friendly. We stopped for half an hour, maybe more, standing around enjoying the sunshine and coffee. By chance we took the crossroads on the other side of the pub and headed up what soon became a forest track called Tiger Hill Road. The scenery overlooking Tatong was quite breathtaking and we stopped to warm our hands on the coffee thermos and the opportunity to soak up the winter sunshine. We followed the road with a sense of adventure with no real idea of where we were going but it was fun and interesting. Two things did become apparent, the road was better suited to four wheel drive and we were climbing. After half an hour it became clear this was mainly used by forestry vehicles and round a bend we realized how much altitude we had gained when confronted by snow. 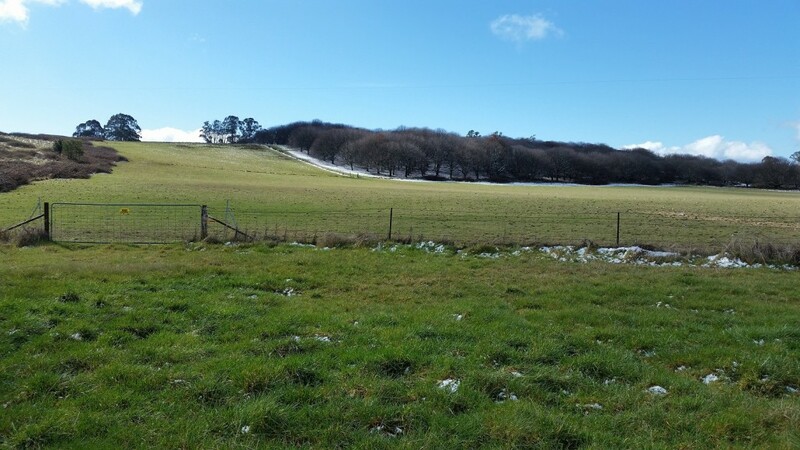 Seeing snow this far from the mountains in the middle of the day in bright sunshine is not what we were expecting. Right at the top we came across a few farms with little snow drifts in the shaded areas. It took a little while to reach the bottom and we then took the road left for a revisit of Mansfield, that posh little town so favoured by moneyed folk from Melbourne as a place for a holiday home. Leaving Mansfield we travelled west to Lake Eildon, which although constructed decades ago, still has the bare-dirt look of something finished recently and grass has not had time to grow. 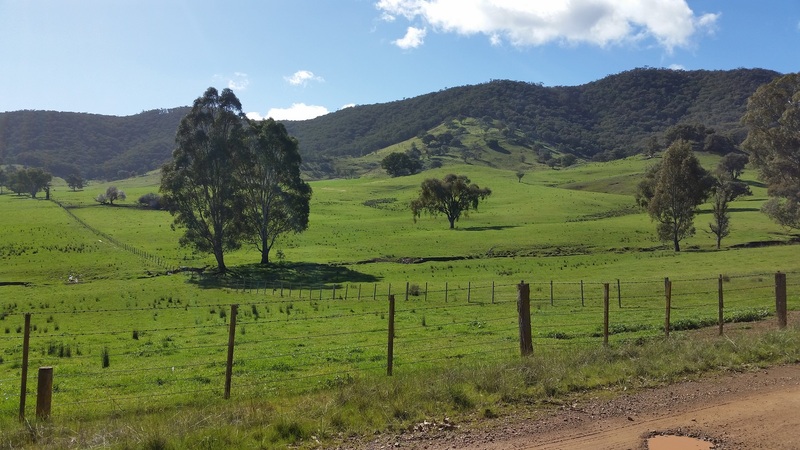 After a quick reconnoitre we continued north 40 ks or so to Euroa, arriving late this winter afternoon which is a pity because it’s the sort of little town that inspires the thought “I must come back one day” and never do. 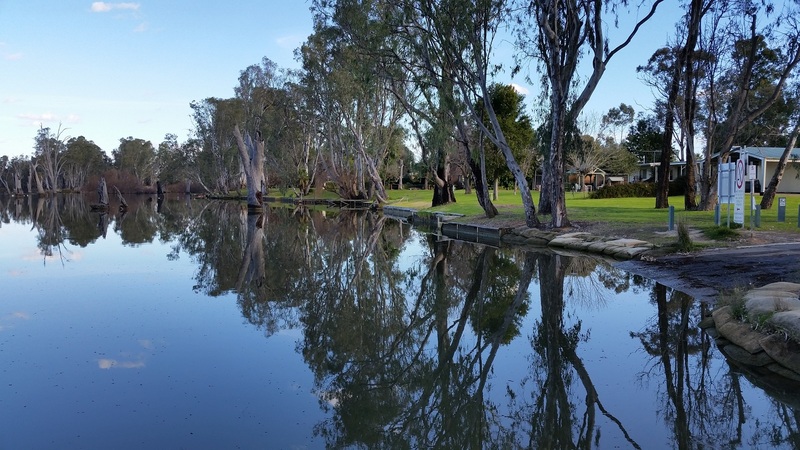 With our time are Glenrowan finishing fast, the following day we drove up to Yarrawonga on the border between Victoria and NSW, putting it immediately west of the more famous border-city pairing, Albury Wodonga. 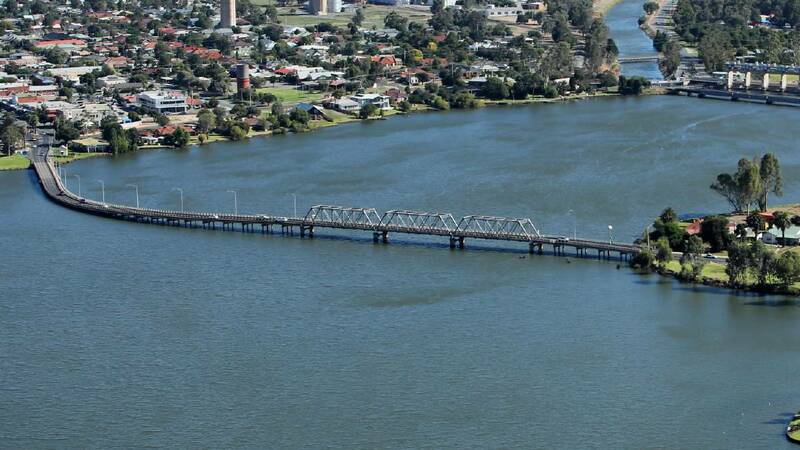 The less well known companion town to Yarrawonga is Mulwala which is on the northern opposite bank of the Murray River in New South Wales and gives its name to the lake which was created when they put a weir across the river in 1939. 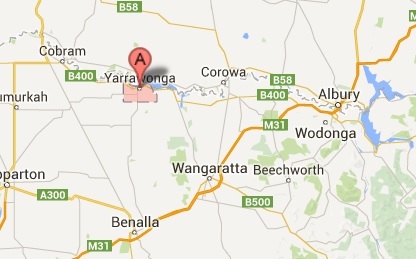 Only 7,000 people live in the area but Yarrawonga is on the tourist trail mainly because of the lake I guess. It seems funny now but before the weir was built, the construction of a replacement for the old wooden bridge was started two decades earlier, just before the end of the First World War. Under an agreement between the two state governments, two construction teams got right to work and they worked diligently too, however, nearing completion they discovered a small problem. It didn’t meet in the middle. It seems there was some confusion about how much water was going to be under the bridge and amazing as it is, they began construction at different levels. As if having a bend is not enough, the bridge still has its embarrassing dip to this day. Just as the Second World War started, they built the weir which created the lake and formed a second crossing. Fortunately there was no need for a bend and a dip to drive across it. I understand there is some talk of creating a new bridge. My guess is they will double check the levels. We followed the lake for about 20 kilometres to its eastern end where the Murray becomes a river again at a village called Bundalong and met a couple who were fishing near the boat ramp. 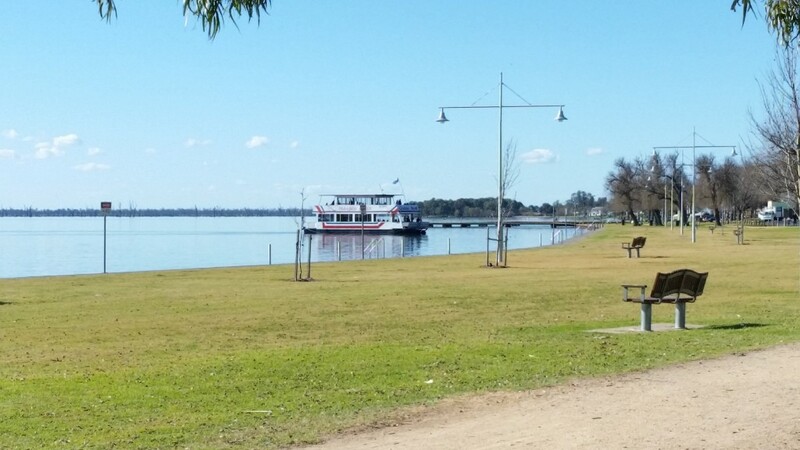 Ian and Derris own a small motel in Corowa a little further east and had taken the Sunday afternoon off to spend by the river. They hadn’t caught any fish while we were there. 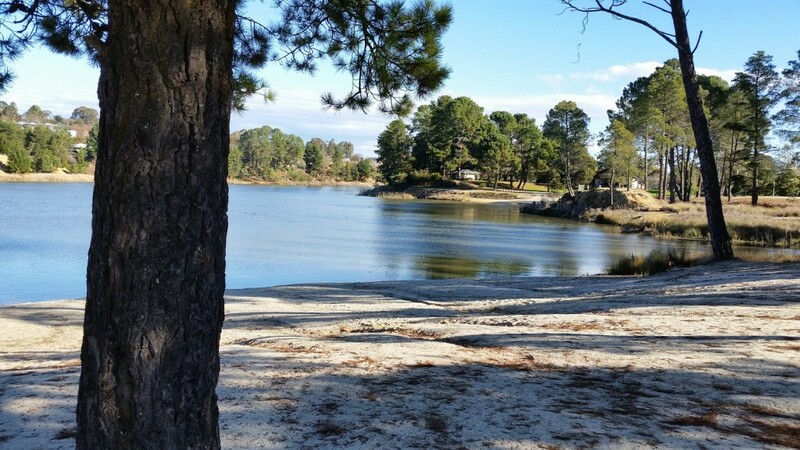 It took another couple of hours to finish our slow drive, following the Murray River as far as possible, stopping at lakes and bends to check it all out. You’ve got to give it credit for beauty and peace although the fishing is a bit marginal I think. 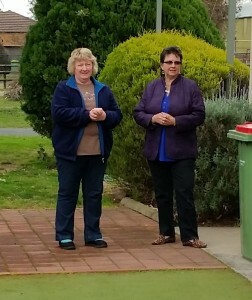 On the following Thursday we made out last sightseeing trip from Glenrowan, up to Corowa to visit our new friends, meeting Ian and Derris at their ’Golfers Retreat’ motel for a coffee. This is a real surprise packet, a very small private motel that you really do need a map to find. Apparently the clientele are mainly those involved in, yes you guessed it golf at the nearby course, but also a swag of glider pilots who stay for several months each year during the season and subsequent competition. Who would have guessed that? The motel is super neat and very quiet so I can give it my full recommendation. Cheap too I reckon. While we had nearly two weeks to go, niggling issues with the campervan and the normal push near the end to get everything in order encouraged us to curb our wanderlust for now and get ready for the long trip to Adelaide. Early morning of Friday 22nd of August 2014 saw us trundling down the driveway and making a bee line for the highway. Thanks for letting me know. I’m encouraged now to add them to future articles.